Some of you may know Steve Valentine from TV's CROSSING JORDAN or I'M IN THE BAND, some may remember him as the sly magician on HOUSE or the evil one on MONK, but did you know that back in the day Steve was one of Hollywood's top close up magicians? Vegas headliner and two time winner of The Magic Castle's CLOSE UP MAGICIAN OF THE YEAR, Steve was a highly sought after entertainer in the Beverly Hills- private party- circuit. In 1999 Steve quietly retired from performing magic professionally but never lost the love. Over the years many people have asked what happened to all of the powerful and original close up material that Steve honed over thousands of shows for incredibly demanding clientele. The material that put Steve where he was. The answer is here, Steve has finally agreed to release a limited edition Pro Magic series of teach in Downloads. Starting with his favorite packet effect THREE. A trick that has blown away the likes of Gregory Wilson, Joe Monte and Richard Kaufman. THREE is the perfect walk around packet trick: visual, entertaining, modular, no reset, put the cards back in your pocket and you're ready to go again. There's nothing to break during performance and at the very end everything can be examined. What more do ya want? 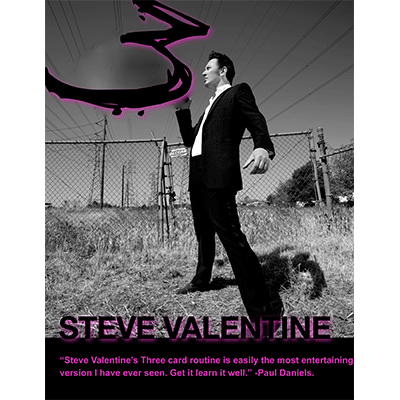 THREE by Steve Valentine, available from magic dealers everywhere. "This one routine has more MPM (Magic Per Minute) than most complete acts!" NOTE: The gaff cards required are NOT included with this download. However detailed instructions are included on how acquire the cards/make them. Save $5 and shipping costs by buying this download instantly verses the physical copy.